Gomo is what I would describe as an entry-level point-and-click adventure game. It’s a short game, with simple puzzles, and just enough charm to keep it entertaining for the single hour that it lasts. The question is, is it worth the price of admission? 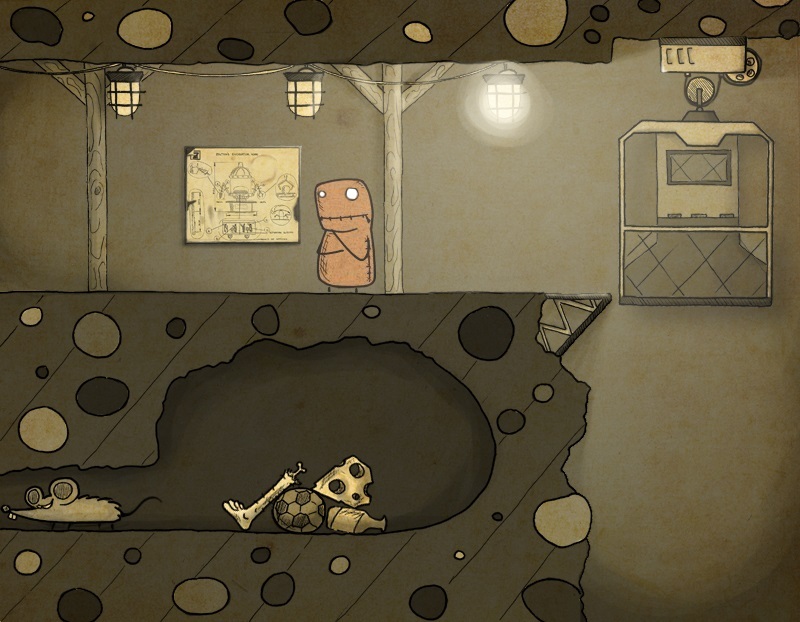 Like most point-and-click adventures, playing Gomo is a matter of solving progress impeding puzzles by using whatever happens to be lying around in order to lift gates, open doors or generally clear the way forward. In that regard, Gomo is one of the easiest games of the genre I have ever played. Most of the puzzles involve only one or two items, and since the puzzles take place on a single screen, it doesn’t take long to fit the square peg into the square hole. To be fair, there are a couple of other types of puzzles as well, such as one that is similar to the popular Unblock Me app that is available on mobile devices, and a small sliding puzzle, but these do little to add much challenge to the game. The best thing I can say about Gomo is that it has a couple moments that put a smile on my face and the hand-drawn artwork is nice. Although the animation and character design is relatively simplistic, it nonetheless manages to convey emotional vignettes that often have nothing to do with the main storyline. For example, while transitioning between one puzzle and the next, I noticed an animal growling at a small creature. It looked like the animal was going to attack the creature, but a moment later, the creature jumped on top of the animal and they walked away as peaceable companions. Random short stories like these pop up frequently throughout the game, and for what it’s worth, I enjoyed them, but they really have nothing to do with anything. The problem is these background stories are far more interesting than the main plot! The primary storyline can be summed up in a single sentence, so consider this your spoiler warning. An alien kidnaps a dog and the dog’s owner, Gomo (who looks like Sackboy’s deadbeat uncle), has to use his squiggly arms to find a crystal to deliver to the alien as ransom. That’s about it! During Gomo’s journey, bizarre events frequently occur in the background. These can be anything from watching a packrat store a collection of unusual items to an all-out war, but without these happenstance events being connected to an overall cohesive storyline, they are ultimately pointless—though mildly amusing—distractions. So it comes down to the gameplay itself to make a case for Gomo, and that’s where the game truly falls flat. As I mentioned before, the puzzles are far too easy, but there’s also an issue in terms of pacing. Gomo moves about pretty slowly, and it’s amazing how tedious simple tasks like walking across a room can become, despite the short length of the entire game. And every time Gomo picks up an item, you have to watch him grab the item, slowly unzip… uh… something on his back, and place the item in it. A similar animation occurs whenever he uses an item, and it all just bogs down the pace. Though I suppose it would make a short game even shorter if these animations were trimmed down. Stick with the game for an hour and it will be over before you know it and you’ll be left wondering if it was worth what you paid. Gomo is available on Steam for $7.99. For a strictly average game, even a price that low is too high, especially considering how short the experience is. $3.99 (or less) seems like a much more appropriate price, so if you’re curious about Gomo, I suggest you wait for the inevitable sale on Steam that will likely discount it by as much as 75%. It’s not a bad game per se, it just ends before it really gets going, and lacks challenge for anyone familiar with the genre. There is a certain charm about Gomo that might appeal to a player with a slightly odd sense of humor or fondness for squiggly arms. But I think the majority of gamers can safely let Gomo pass them by without feeling as though they are missing out on anything essential. 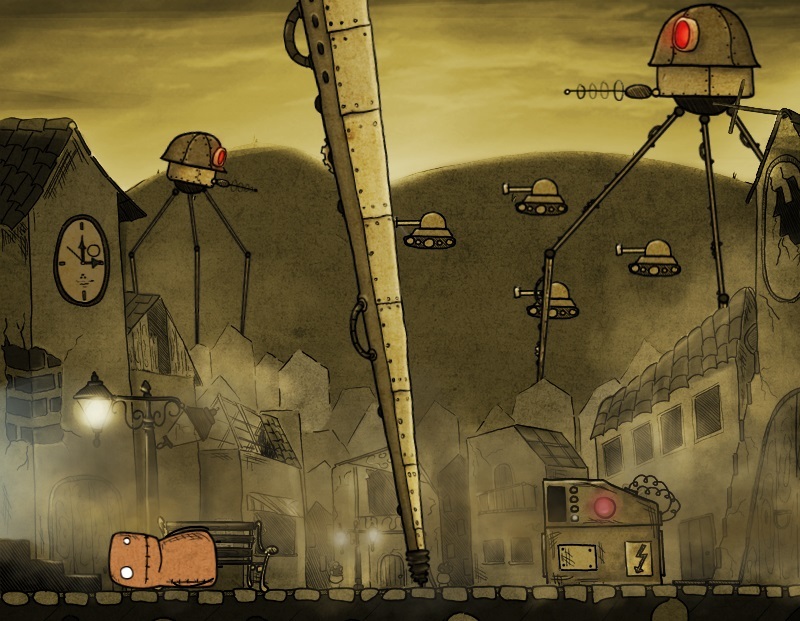 Ari received a copy of Gomo from Daedalic Entertainment for review purposes and completed the game in 73 minutes.